Occasionally throughout the OHWM, but particularly in the “Mid-century” chapter, RT veers away from music history proper in order to offer a history of music history. These sections, I think, yield some of the most rewarding morsels in the book, setting aside the characters and plot for a moment to focus on the structure of the narrative itself and how it got to be that way. Reviewing the choice clip in the latest “Darwinian Music” post, a couple of words really stand out. As RT points out, musicians in the middle of the nineteenth century, inspired by the historical philosophy of Hegel (and the Young Hegelians), came to see that history had a “purpose,” and that the prime aim of any artist should be to align themselves with that forward-thrusting cause. The “artwork of the future” was a product of evolutionary progression, and those out of line with this ineluctable force were of no historical significance. (The implication here is that such musicians would be lost to history.) From this philosophy emerges a trinity of concepts which together make up the idea of historicism: purpose, progress, and evolution. This notion is so natural to many of us today that it’s easy to forget just how historically anomalous this notion was. To create music based to a large extent on the perceived dictates of history? Surely as far as creative impulses go, this one is a rarity in the vast world of music. People make music for individual pleasure, for dancing, for socializing, for God, for courtship, for rites of passages, for a deeper relationship with nature… to make music in order to “further the ‘evolutionary’ progress of the art,” as RT puts it, would probably strike most people around the world as completely inexplicable. Yet somehow it stuck. Purpose, progress, and evolution are directional concepts; they imply a goal towards which their momentum is directed. Inherent in this very idea, then, is a certain level of teleology, or goal-orientation. A purpose-driven, historically “necessary” music evolves towards something, and in doing so implies the end to that very process. There’s something vaguely apocalyptic about this philosophy of history; once this paradigm took root, the great Götterdämmerung of the Western art music tradition was prophesied, the wheels set in motion. This has to do with the fact that, in the West, purpose, progress, and evolution were interpreted along entirely technical lines. That is to say, “historical” composition was that which pushed the envelope of harmonic innovation and structural daring, challenging conventional (read: ahistorical) norms in pursuit of progress. With the development of compositional technique yoked to an almost messianic devotion to the “impersonal aims of history,” an endgame is implied. What, after all, is left to be done after every conceivable technical wall has been knocked down, every note liberated? Schoenberg understood this well: history demanded the complete abolition of tonality. If he didn’t make the final leap, someone else would have, because this final step was required by the teleological treadmill. The 12-tone system, in this historical paradigm, was inevitable. There will be plenty of opportunities in the future to discuss the “endgame” – and ensuing rubble – that this historical process unleashed. The rubble of the 20th century, of course, was not the end of music (though one recent reader cleverly quipped: “I won’t spoil the ending for you: by 2010 there is no music left at all!”) It did, however, represent in certain important ways the end of a particular historical path, one that was formulated and embraced during the mid-19th century. I’m reminded of philosopher/art critic Arthur Danto’s brilliant book After the End of Art. Like the above, his argument is not, of course, that art “ended” at a particular time; it did, however, become unyoked from the historical trajectory that it had been on for a very long time. Art in the rubble of a collapsed historical purpose is “post-historical”: it exists outside of the driving narrative of the Western tradition, and is thus aesthetically diffuse. (The “Western” element here is imperative: perhaps this accounts in some ways for composers’ embrace of the East, particularly from the 1950s on. With the Western historical narrative at an end, musicians turned to different models of time, history, and creativity.) Today, argues Danto, there is no historical path forward. We are at a conceptual impasse: some of us are eagerly pining for a new, unifying historical model to take hold; others are happily dancing on the grave of history. Purpose, progress, and evolution, when tied to musical technique in the service of historical advancement, led, paradoxically, to the end of history. Paraphrasing RT (in another context): is this “progress”? Have you been doing your musicological beach reading this summer? We’re in the process of updating the must-reads list with new entries, and I wanted to take this opportunity once again to solicit suggestions (either credited or uncredited). Let us know which works you find completely indispensable to the field (and for music-lovers generally), and we’ll make sure they’re included. Even though the header image we’ve had for the last month or so has been one of my favorites (Friedrich’s, Wanderer Above the Sea of Fog, 1818), it’s time for a fresh look. 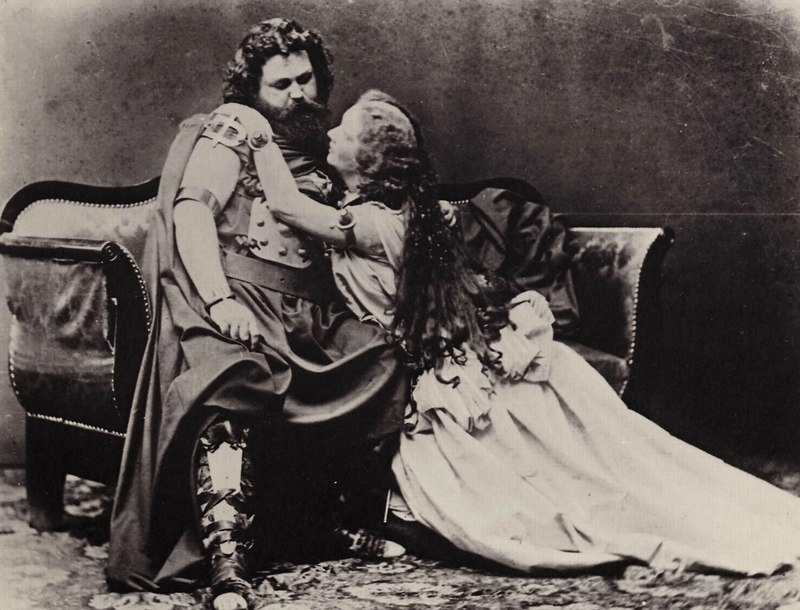 Since much of the reading this week and in the coming weeks will deal with Wagner, our new header features the husband and wife singers who created the roles of Tristan and Isolde, Ludwig Schnorr von Carolsfeld and Malvina Schnorr von Carolsfeld. Taruskin calls Tristan und Isolde (completed 1859, premiered 1865) “a touchstone for all subsequent music-making and music-thinking.” (III, 539) The full photograph is below.